The announcement by Amazon founder Jeff Bezos, the world’s wealthiest man, and his wife that they will divorce has captivated the imagination — how will they split his giant fortune, estimated at $136 billion? 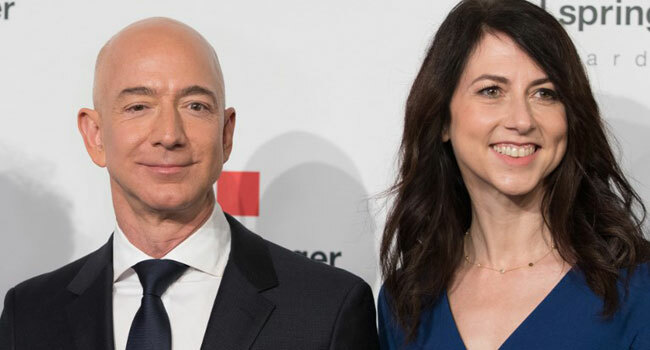 She was by his side for the entire Amazon adventure, from the company’s humble beginnings in his Seattle garage in 1994 to its mammoth success today. They have four children — three sons and an adopted daughter — aged up to their late teens. “Some states have community property, some states have equitable division which means fair division, but even in those states, it usually comes out 50-50. That’s the starting point,” he said. Bezos, who was once Amazon’s primary stakeholder, now owns about 16 percent of the company — the bulk of his net worth. Given they appear to be on good terms, they could decide to put their shares into a trust or other legal mechanism in order to maintain the same power among Amazon’s shareholders. “Voting rights may not be that important in this case because Jeff Bezos is currently a minority shareholder anyway,” Ryznar says. “Clients come to see me all the time and they always say that this is going to be uncontested — ‘We’re both reasonable, we both agree that it should be fair’,” Kessler says. “If they disagree, that’s where lawyers make money,” Kessler said.